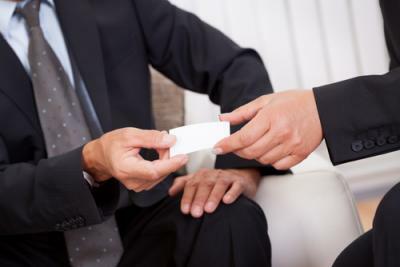 The tradition of exchanging business cards began in China in the 15th Century but gained wide acceptance in 17th Century Europe when cards were used to announce the impending visit of royalty or aristocratic visitors. Over the years that followed, presenting a card upon arrival at a home or business quickly became a well-established practice. Gold engraving and typefaces that stood out were the norm by the middle of the 19th Century and having a noteworthy card became a must for any business person. In today's digital world with the vast majority of business communication now taking place by email, the exchange of business cards is still a standard procedure when meeting business associates face to face for the first time. In fact, statistics by the Statistic Brain finds that some 27.4mm business cards are printed daily, about 10B are printed annually in the US, 88% are thrown out in less than a week after receipt and it takes about 2,000 cards passed out to achieve a 2.5% increase in company sales. Despite a digital world, the data shows the exchange of this physical piece of paper remains nearly as important as it has always been. A few years ago, the media called for the end to physical card exchanges due to the development of apps that could transmit contact information with a bump between cell phones. Not every phone talks to one another though and with a dozen different apps and no universal adoption of any of them, the electronic exchange of contacts never really took off. Fast forward and one finds there are some useful apps out there for keeping track of the cards bankers may pick up at conferences. CardMunch was one of the first, a LinkedIn subsidiary that would take a photograph of a business card and then connect the information to the LinkedIn page of the holder. LinkedIn discontinued support of CardMunch in July of 2014 though and went instead to a similar product called Evernote. Transition wasn't all that easy for users though, as initially Evernote only worked on Apple phones. An Android app became available a few months later but the gap was apparent to Android users. Enter the SBA, which points out in its Industry Word blog that a 2014 survey found 87% of Americans still exchange cards when meeting someone for the first time. For its part, SBA had some best practices ideas on making your cards notable including using better quality paper, well-designed graphics and a focus on branding and message. They also suggested people use both sides rather than a cluttered facade. There are numerous good reasons that business cards are prolific still: they don't have technological flaws or problems interacting with others, cards work with everyone you meet regardless of their level of technological advancement, they provide a visual queue to remind you of the place you met the person, they don't get lost like an email or an Outlook contact and finally people like the ritual of exchanging cards. In this time of everyone seeking innovation in all things and with "disruption" the highest praise possible for an idea, there are still traditions that continue. Maybe a physical piece of evidence has gained even more importance as a reminder that you actually met someone, because so little modern communication is face to face. With that in mind, we remind bankers that nothing beats face to face for building and retaining business. Therefore with the onset of spring, it's a great time to get out and see business customers and prospects. So, get up from your desk, walk out the door and go see your customers in their place of business. When you do, don't forget bring your business cards. Treasury yields fell 1bp in reaction to FOMC comments that economic growth has recently become sluggish. Yields are currently unchanged ahead of personal income and jobless claim announcements. Research by MarketingSherpa finds 91% of US adults like to receive emails from companies they know and is the most preferred communication method for current customers. Other preferred methods in order were postal mail (48%), TV advertising (34%), print media (31%) and social media (20%). It is interesting to note that the US bond market is about $35T in size compared to about $5.3T in foreign exchange per day and about $2.6T daily outstanding for the repo market. This also compares to about $169B average daily trading volume for the NYSE. Research finds about 13B checks are written every year in the US. A survey by public relations firm the Brunswick Group and reported in the NY Times finds 54% of M&A deal makers believe 2015 will be better than 2014 in terms of global merger activity (vs. 78% last year). In recent congressional testimony, the Senior Deputy Comptroller said the OCC supervises about 1,400 institutions with assets under $1B and that about 67% of its examination staff is dedicated to this group. In recent congressional testimony, the Director of Risk Management Supervision said community banks make up 93% of all banks in the US (highest percentage since at least 1984), hold 13% of bank assets and account for 45% of all small loans to businesses and farms originated by insured institutions. A report by Genworth Financial finds the median bill for 1Y in a nursing home is now $91,250 vs. $87,600 one year prior, but that costs vary widely by state. The highest was AK at $281,415, but was only $60,225 in OK. Meanwhile, the median cost of an assisted-living facility was $43,200 and 1Y of visits from home health aides was $45,760.